*I originally started this over a week ago and edited it. I wasn’t ready to press publish until today. The past few weeks have been really difficult for many people in our community. We lost a friend, a classmate, a daughter, a sister, a loved one, a father, a great man, a doting dad. So many descriptors of two souls who were taken from us too early. A father and a daughter died in a car accident on Saturday, August 29th. I won’t ever forget that date because my husband and I were actually at a wedding when we got the news that a fellow cheer sister of my daughter was killed along with her dad near our home late in the afternoon. The news cut even deeper when we realized that this girl was our neighbor/family member Hailey’s flyer from the year before. Hailey was at home watching Ella while we were at the wedding when she got the news, so we left the reception immediately to be with her. Anna knew Haylie from cheer but also was a classmate of hers as well. A lot of people are making the connection of Haylie a cheer connection but she was also a friend, a classmate, someone who went to school with a lot of people. She wasn’t just a cheerleader even though that was a very big part of her life. But it is indeed from cheer that people in our community are most associating her. When Anna was recently at the doctor for an upper respiratory infection and had her cheer t-shirt on, the nurse immediately recognized the name and asked her about Haylie because she had seen it on the news. She kissed Anna on the forehead and started crying and in turn, Anna started crying. Anna holds a lot of emotions on the inside and this obviously has been hard. My daughter is a girl of few words but I won’t ever forget what she said when she found out it was an open casket at the wake. She said quietly, “I get to say goodbye to her”. I get to say goodbye to her. I didn’t personally know Haylie but I knew her mom through all that cheerleading brings with it. Working in the concession stands together, working the long hours of competition season, passing each other at the many parent pickups that cheer involves. Cheer, like many other sports, is intensive and the athletes are together a huge amount of time. You end up becoming close to many of these people, one could say, a family of sorts. Anna is very close to some of her cheer sisters, as they call each other, especially those in her stunt groups. They have each other’s backs and the friendships she has formed from cheerleading are tighter than any other bond she has ever formed. Because they literally have each other’s backs, lifting them, protecting them, shielding them from getting hurt.The past few weeks were filled with a lot of emotions for many people we are close to and it is has been emotionally draining but I have been up to the task. I have been doing most of my crying in the car on the way to pick Anna up from practice or at the computer keyboard while I am writing a post about Haylie and her sister who, thank you, God, lived and didn’t leave her mom to go through this alone. I will lift those around me up who are struggling because they were much closer to the mom and need lifting. I will donate my time and my hands in service to help make a meal for the family with my friends who will do the same because it is the least we can do for a family who is, as you can imagine, struggling to put the pieces back together. There is only one good thing that comes out of death and that is the beauty in people that come out. And what beauty there is in this world that I believe can only stem from the two angels that are looking down from Heaven right now as we are doing all these amazing things in their honor. Our Junior Varsity squad has become tighter, bonding together after this. At the last team dinner, the table where our JV girls were sitting was bursting at the seams, normally all divided between different tables, they almost all were at one table, trying desperately to squeeze one more chair in to fit. The JV moms have come together as well and we have become a group who have been texting in groups, lifting each other up, even having a girls night in filled with love, tears, laughter and sharing pictures of our kids in action. 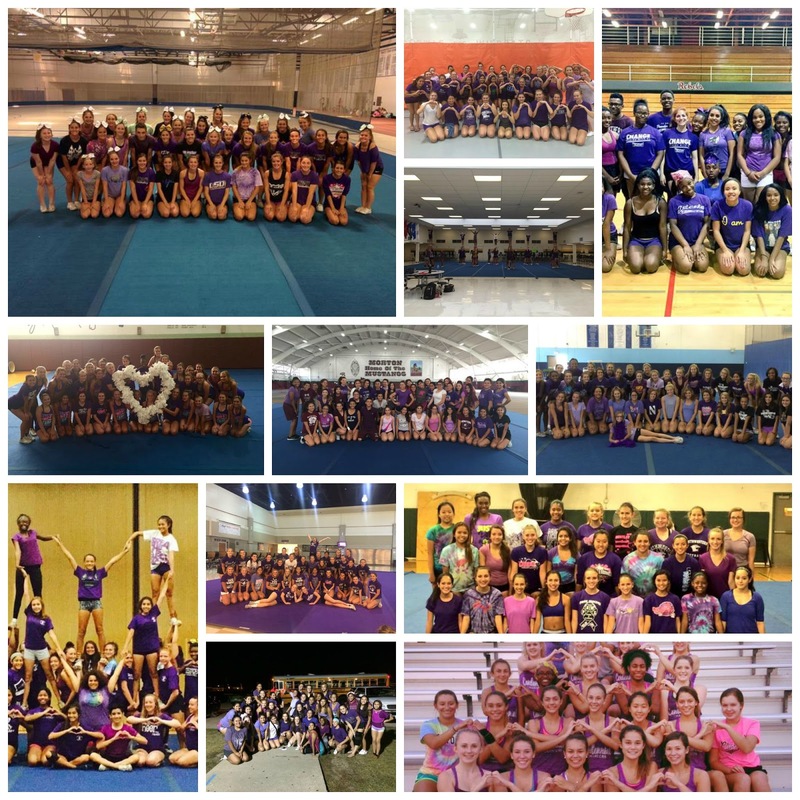 On the Monday after the accident, Twitter was full of cheerleaders from all over the state of Illinois who were sharing pictures of their squads wearing purple in honor of Haylie (her favorite color) to remember her on that day. these are just a few, I couldn’t fit all of them on this graphic. The outpouring of support from the community in the form of a GoFundMe account that is at 55,000 dollars and counting for the mother and daughter. The meal train that keeps growing by the day and still needs your help. The support that is being offered to the cheerleaders by the school and the coaches and the communities near and far. Then in the midst of all of this and as I was writing this, I got a text from my dear friend, Melissa. Her water broke early and she was at the hospital. The circle of life is an amazing thing. She had a beautiful baby girl. Please spread the word of love and healing and help this family to heal with your prayers, your service and your time. Honor Haylie and her father Christopher’s life in any way you can. Life is so short and precious, make it count. You can visit the above links to help the family out in any way you are able. The outpouring was huge in the beginning but is trickling in now as the weeks go by so this is when this family needs the support the most. This post is dedicated to the memory of Haylie and Christopher Winiewicz.